Many years ago (damn it! ), the Dairy Queen that was on MacArthur Blvd., one block away from MacArthur High School, would freeze bananas on a stick and then dip them in the chocolate shell they used for dipped cones. This process turned an ordinary piece of fruit into something of surpassing wonderfulness. When I was extremely pregnant with my daughter (also many years ago, damn it! ), I went for a check-up on a Monday, and was told something to the effect of: “Wow – you could have this baby almost anytime! Come in tomorrow for an induction so we can be sure you won’t be delivering tomorrow evening in Houston rush-hour traffic. And don’t eat anything after midnight.” The local Dairy Queen drive-through closed at 11:00 pm, so I went up there at 10:55 pm in order to have my very favorite food item just before going NPO at midnight. But – a couple of years ago, I discovered Diana’s Banana Babies! Right in the freezer at my supermarket! 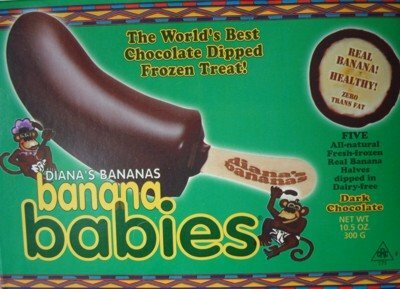 Half a banana, frozen on a stick, and dipped in chocolate! With choices! Milk Chocolate! Dark Chocolate! Rolled in Nuts! So yummy. So simple. And I no longer get those crazy looks from the kids at random DQ drive-throughs from my wistfully asking if they have frozen chocolate-dipped bananas.